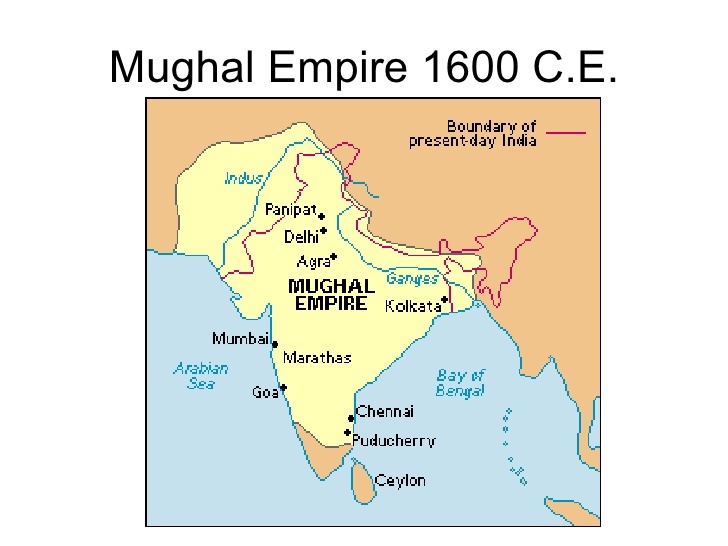 The Mughal Empire or Mogul Empire, self-designated as Gurkani, was an empire in the Indian subcontinent, established and ruled by a Muslim dynasty of Chagatai Turco-Mongol origin from Central Asia. The Moghuls were a powerful Muslim family who came from lands that are today part of Afghanistan and Uzbekistan. 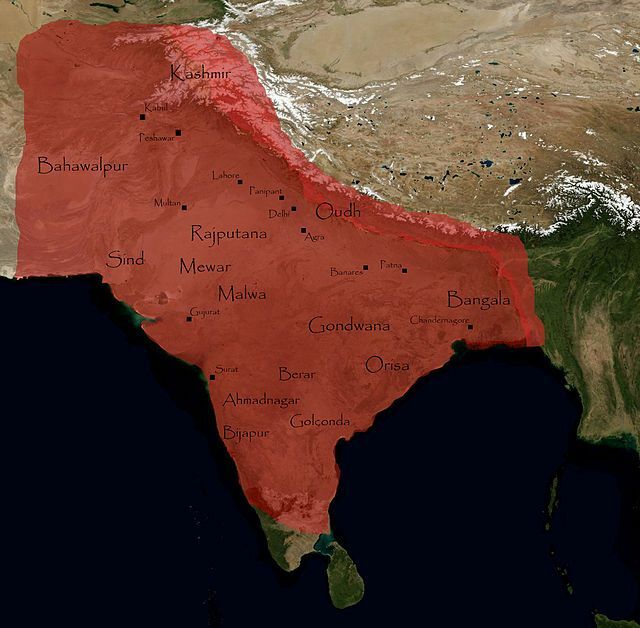 The Moghuls conquered almost all of south Asia in the 16th century. The Emperors ruled over a population that mostly practiced the Hindu religion. The first Moghul Emperor was called Babur. He conquered much of north India. Here is an account of a decisive battle. Babar (1526-1530): the great grandson of Tamerlane and Genghis Khan, was the first Mughal emperor in India. He confronted and defeated Lodhi in 1526 at the first battle of Panipat, and so came to establish the Mughal Empire in India. Babar ruled until 1530, and was succeeded by his son Humayun. Humayun (1530-1540 and 1555-1556): the eldest son of Babar, succeeded his father and became the second emperor of the Mughal Empire. 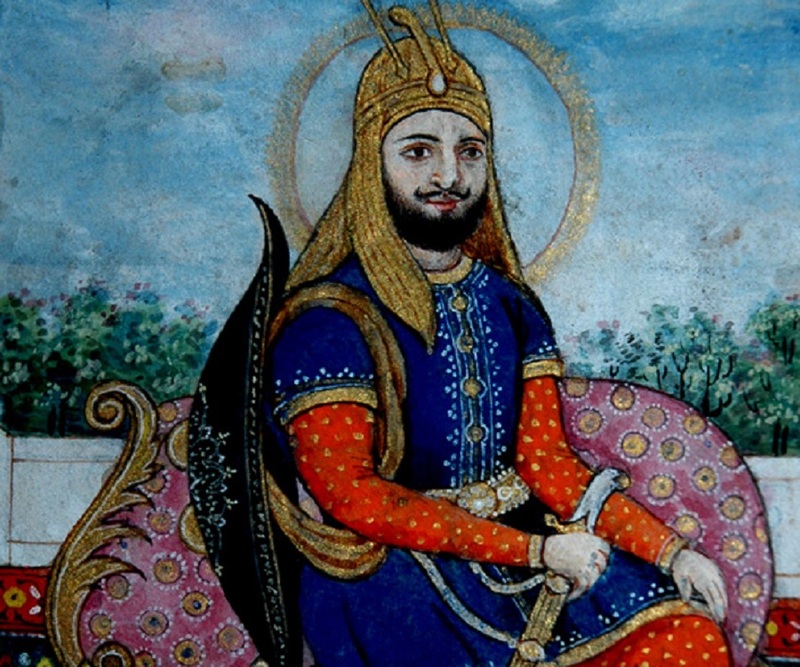 He ruled India for nearly a decade but was ousted by Sher Shah Suri, the Afghan ruler. Humayun wandered for about 15 years after his defeat. Meanwhile, Sher Shah Suri died and Humayun was able to defeat his successor, Sikandar Suri and regain his crown of the Hindustan. However, soon after, he died in 1556 at a young age of 48 years. Sher Shah Suri (1540-1545): was an Afghan leader who took over the Mughal Empire after defeating Humayun in 1540. Sher Shah occupied the throne of Delhi for not more than five years, but his reign proved to be a landmark in the Sub-continent. As a king, he has several achievements in his credit. He established an efficient public administration. He set up a revenue collection system based on the measurement of land. Justice was provided to the common man. Numerous civil works were carried out during his short reign; planting of trees, wells and building of Sarai (inns) for travelers was done. Roads were laid; it was under his rule that the Grand Trunk road from Delhi to Kabul was built. The currency was also changed to finely minted silver coins called Dam. However, Sher Shah did not survive long after his accession on the throne and died in 1545 after a short reign of five years. Akbar (1556-1605): Humayun’s heir, Akbar, was born in exile and was only 13 years old when his father died. Akbar’s reign holds a certain prominence in history; he was the ruler who actually fortified the foundations of the Mughal Empire. After a series of conquests, he managed to subdue most of India. Areas not under the empire were designated as tributaries. He also adopted a conciliatory policy towards the Rajputs, hence reducing any threat from them. Akbar was not only a great conqueror but a capable organizer and a great administrator as well. He set up a host of institutions that proved to be the foundation of an administrative system that operated even in British India. Akbar’s rule also stands out due to his liberal policies towards the non-Muslims, his religious innovations, the land revenue system and his famous Mansabdari system. Akbar’s Mansabdari system became the basis of Mughal military organization and civil administration. 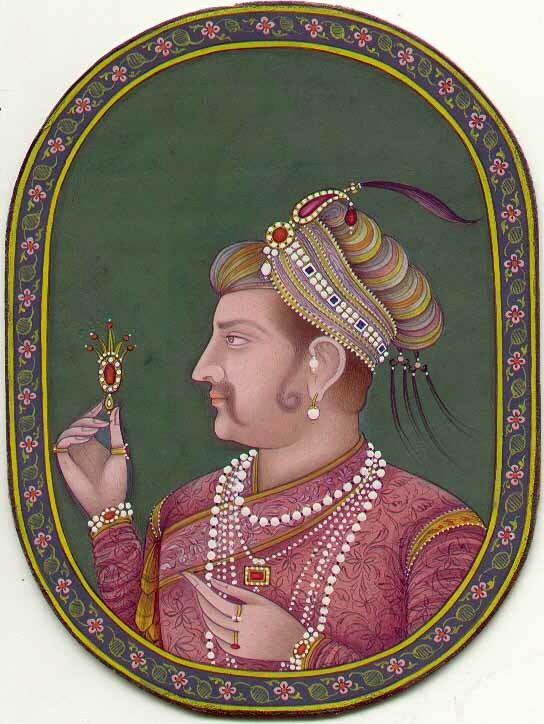 Jehangir: Akbar was succeeded by his son, Salim, who took the title of Jehangir, meaning “Conqueror of the World”. He married Mehr-un-Nisa whom he gave the title of Nur Jahan (light of the world). He loved her with blind passion and handed over the complete reins of administration to her. He expanded the empire through the addition of Kangra and Kistwar and consolidated the Mughal rule in Bengal. Jehangir lacked the political enterprise of his father Akbar. But he was an honest man and a tolerant ruler. He strived to reform society and was tolerant towards Hindus, Christians, and Jews. However, relations with Sikhs were strained, and the fifth of the ten Sikh gurus, Arjun Dev, was executed at Jehangir’s orders for giving aid and comfort to Khusrau, Jehangir’s rebellious son. Art, literature, and architecture prospered under Jehangir’s rule, and the Mughal gardens in Srinagar remain an enduring testimony to his artistic taste. He died in 1627. 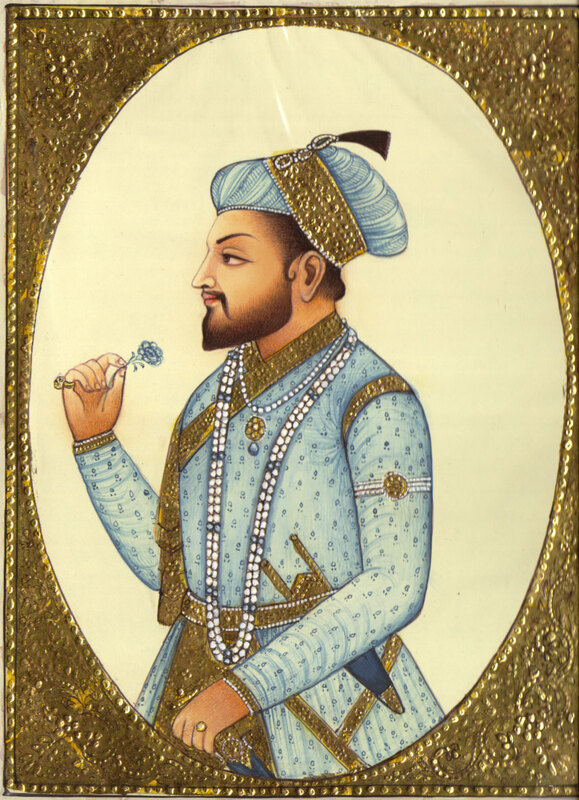 Shah Jahan: Jehangir was succeeded by his second son Khurram in 1628. Khurram took the name of Shah Jahan, i.e. the Emperor of the World. He further expanded his Empire to Kandhar in the north and conquered most of Southern India. The Mughal Empire was at its zenith during Shah Jahan’s rule. This was due to almost 100 years of unparalleled prosperity and peace. As a result, during this reign, the world witnessed the unique development of arts and culture of the Mughal Empire. Shah Jahan has been called the “architect king”. The Red Fort and the Jama Masjid, both in Delhi, stand out as towering achievements of both civil engineering and art. Yet above all else, Shah Jahan is remembered today for the Taj Mahal, the massive white marble mausoleum constructed for his wife Mumtaz Mahal along the banks of the Yamuna River in Agra. Aurangzeb: Aurangzeb ascended the throne in 1658 and ruled supreme till 1707. Thus Aurangzeb ruled for 50 years, matching Akbar’s reign in longevity. But unfortunately he kept his five sons away from the royal court with the result that none of them was trained in the art of government. This proved to be very damaging for the Mughals later on. During his 50 years of rule, Aurangzeb tried to fulfill his ambition of bringing the entire Sub-continent under one rule. It was under him that the Mughal Empire reached its peak in matter of area. He worked hard for years but his health broke down in the end. He left behind no personal wealth when he died in 1707, at the age of 90 years. With his death, the forces of disintegration set in and the mighty Mughal empire started collapsing. The Mughals used the mansabdar system to generate land revenue. The emperor would grant revenue rights to a mansabdar in exchange for promises of soldiers in wartime. The greater the size of the land the emperor granted, the greater the number of soldiers the mansabdar or Zamindars had to promise. The mansab was both revocable and non-hereditary; this gave the center a fairly large degree of control over the mansabdars. As a result of increasingly heavy taxation (initially, the Mughals had not overtaxed), the revolt was encouraged as local people objected to the amount of money spent on the lavish Mughal court. Initially, this also encouraged economic development, establishing a strong system of banking and credit, and issuing paper money. Increasingly, however, they bled the country of its wealth to feed their lifestyle. Ignoring development, they failed to keep pace with the developments of the rest of the world, including those of weapon technology. Art and Architecture of Mughal Art have been successful in creating huge aura among the art lovers. The splendor of Mughal art always appeals to the aesthetic spirit of all art enthusiasts. The subtlety of the finesse and the dazzle of the aura associated with the artistic achievements calls for a keen interest in the subject. Under the Mughals (1526-1858) India grew into a prolific center of cultural cultivation, literary pursuit and architectural marvel, comparable to the Iran under the Safavids. A fundamental feature of Mughal art was manuscript-illumination. A noteworthy example is Persian miniature painting. One of such painting shows a small figure of Akbar, holding a flower and carrying a sword by his side. The presence of the flower and the sword is very symbolic. The flower represents calmness and peace-loving attributes of Akbar, while the sword speaks for his royal origin, blue-blood, and inherent bravery. These Mughal paintings were usually invested with rich imagery and profound meanings. During Humayun’s rule, the intricate illustration of Amir Hamza, a fabulous narrative produced 1400 paintings on cloth were conducted by expert Persian painters. Building style flourished under the Mughal emperors from the mid 16th to the 17th century. The Mughal period marked a striking revival of Islamic architecture in northern India, where Persian and Indian provincial styles were fused to produce works of great refinement. White marble and red sandstone were favored material. The mausoleum built to commemorate Humayun was probably the first great Mughal architecture. The tomb is laid down in a garden with octagonal chambers linked to an exquisite archway and with kiosks, cupolas, and pinnacles affixed to it. The eminent Persian architect, Mirza Miyak Ghiyas, gave shape to it. The use of double dome, and archway inside a rectangular fronton (arena), and park like surroundings are typical of the Shah Jahan period when Mughal design reached its zenith. Rice is the main crop that is grown in India. It’s grown mostly in the eastern and southern part of India. The second most grown crop is wheat which is grown in northern and middle India. In the east, millet, cotton, groundnut, and maize is grown. In the middle of India, wheat, chickpea, cotton, and millet is grown. Traditional Dance continued in this period both in the north and in the south. 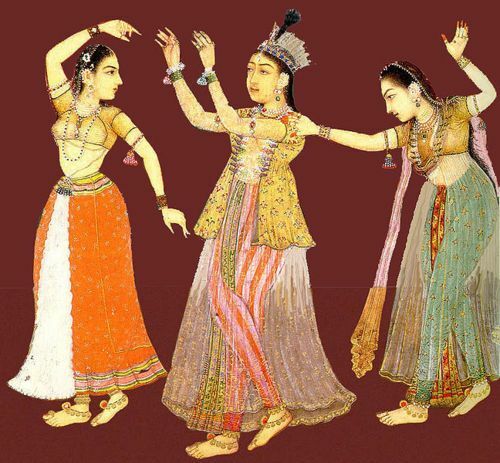 Kathak was a new dance that had developed during this period. But the art was not pursued purely from an aesthetic point of view. Sufism with its religious fervour expressed itself in dance and music that resulted in the Muslims appreciating the music. Khusro was both a singer and a-dancer. Agra was the capital of the Mughal Empire five times. It’s located by the Yamuna River which made it an easy place to trade with other empires. The Taj Mahal is located there which was ordered to be built by the Mughal emperor Shah Jahan. Akbar’s tomb is also located in Agra, planned and constructed by Akbar himself. Shahjahanabad (now Delhi) was constructed by the Mughal emperor Shah Jahan in 1639. It is said to be more secure than the city of Agra. Lahore, located in Pakistan, served as the capital of the Mughal Empire when Humayun and Akbar were emperors. It was called the City of Gardens by the Mughals.